It’s Monday again and I hope everyone had some inky fun this past weekend! I had a great class on Saturday, the ladies were lovely! it is so nice to have some friends to stamp with! 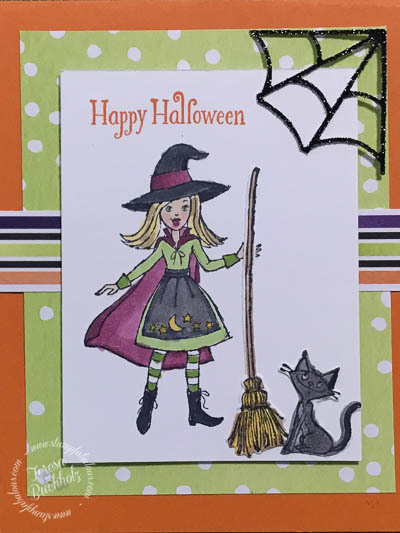 I am working on things from the new Holiday Catalog and here is a card I can’t wait to share! The Toil and Trouble Suite is so cute, and will be available September 5th when the new holiday catalog goes live! Place an order using this code and receive a pack of Mini Dimensionals from me! There are some really great deals in the Clearance center, check it out before you order! Available while supplies last or August 31st. Kittys rule! Next card with be lots of kitties and crazy cat lady! LOL!